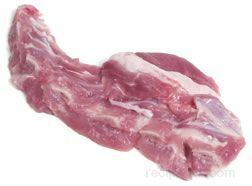 A piece of pork that comes from the loin or the spare ribs of the hog. The loin or ribs are straight cut in order to produce the portion of meat desired. This cut is generally boneless but is also available with the bones in. The riblets are often served in sandwiches either as an open face serving or placed in between a bun.